FILE - People are pictured in the headquarters of the World Trade Organization (WTO) in Geneva, Switzerland, April 12, 2017. Diplomats are searching for ways to prevent the global trade dispute resolution system from freezing up, after the Trump administration blocked appointments to the body that acts as the supreme court for global trade. U.S. President Donald Trump has vetoed the appointment of judges to fill vacancies on the seven-member Apellate Body of the World Trade Organization, which provides final decisions in arguments between countries over trade. "Members are already having a conversation about what to do with this situation," WTO Director General Roberto Azevedo told reporters. "They are floating ideas, they are discussing. We have to see how that evolves." The WTO normally has seven judges and needs three to sign off on every appeal ruling. But two have left and another goes in December, leaving only four — just one above the minimum — to deal with a growing backlog of trade disputes. Azevedo said he did not think the situation was a threat to the WTO's survival but it was already having an impact, and the longer it went on the more acutely it would be felt. 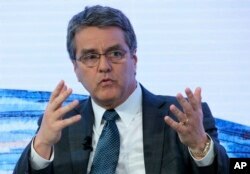 FILE - Roberto Azevedo director general of the World Trade Organization, speaks at the annual meeting of the World Economic Forum in Davos, Switzerland, Jan. 19, 2017. In a confidential note sent to all WTO members on Monday, a copy of which was reviewed by Reuters, the Appellate Body said departing judges would continue working after they left on appeals filed before their terms ended. The United States has objected to that practice in the past. Appointments to the Appellate Body are meant to be unanimously agreed by all 164 members, like all decisions at the WTO. The fine print says the WTO can switch to majority voting if necessary, but diplomats are reluctant to do that for fear of unravelling a system that relies on consensus as a bulwark to protectionism. Azevedo said the Trump administration had made clear it had misgivings about the way the world trade system has functioned, although it had not linked any specific demands for reform with the decision to halt appointments to the appeals panel. The Trump administration has not publicly explained why it is blocking the appointment of judges to the trade panel. The U.S. mission to the WTO in Geneva declined to comment. Several trade experts said the move seemed to fit Trump's ideology of favoring bilateral trade deals over the multi-lateral system embodied by the WTO. Pieter Jan Kuijper, professor of law at the University of Amsterdam, said Trump's trade representative, Robert Lighthizer, preferred the pre-WTO practice of negotiating the outcome of trade disputes rather than being bound by WTO rulings. Although Trump regularly says Washington has been hurt by trade disputes, WTO experts mainly say the United States has actually been a big winner at the WTO. But negotiating the outcome of trade disputes rather than leaving them to judges might tip the balance further in Washington's favor. Kuijper compared Trump's stance to that of Zimbabwe's former president Robert Mugabe killing off the court of the Southern African Development Community by blocking new judges when the court became too troublesome. "That example doesn't make one optimistic," he said. "We are in a true emergency where we should take into account that the end of the Appellate Body may come, either by design or by accident." At a panel discussion Monday for trade officials and diplomats, Kuijper and other trade experts discussed possible ways to avert a crisis if more vacancies come open. One solution would be to switch to majority voting for appointing judges. Another would be for the judges to change their own working procedures, refusing to take any more appeals until there are more judges. Nicolas Lockhart, a trade lawyer at Sidley Austin LLP, suggested the WTO could use its arbitration process more to resolve disputes and rely less on appeals. All three approaches have drawbacks, including the risk of further alienating the United States. "A process that could lead to a situation where the United States leaves the WTO in a huff is actually a situation where everyone loses, and the last thing we should be aiming for," said Alice Tipping, a former New Zealand trade diplomat now at the International Center for Trade and Sustainable Development.